I’m not sure which T-square to order? Before ordering a T-square from us we recommend you take some guide rail measurements. The brand of table saw is not the key, but the type of guide rail that is attached. Most of our United States customers order the Standard T-square and the majority of our International customers order the Adjustable T-square. If you’ll like to take four measurements of your guide rail and email us at verysupercooltools@gmail.com or call us at 512-537-5255 we’ll be happy to help you. You’ll need to measure the height and width of your guide rail tubing, the distance from the top of your table saw to the top of the tubing, and the gap space between the tubing and the angle iron. For more details visit the GUIDE RAIL section of this FAQ page. Does your T-square fence work with all brands of table saws? Any table saw can have an angle iron and tubing system attached to it. It’s not the brand of table saw but the type of guide rail that determines whether our t-square system will work with your table saw. The good news is that most table saws guide rails can be replaced. 13/16 inch step down (or 21mm) from the top of the table to the top of the installed tubing. A minimum of 3/4 inch(or 20mm) parallel gap throughout the entire length of the angle iron and tubing connection. For more info visit the GUIDE RAIL portion of this FAQ section or give us a call at 512-537-5255. Can your T-square be used without an aluminum extrusion? Yes, it can, though we aren’t sure why you would want to. We love aluminum extrusions because of all the options they offer. Our fence is designed to be used with t-nuts and bolts so that the extrusion can slide on and off quickly and allows you to add any number of jigs and stops with ease. The possibilities are endless. You could attach a milled up straight piece of wood, some steel tubing or a piece of angle iron as your fence. Anything that you can figure out how to bolt to our mounting block will be able to work as your table saw fence. Does your T-square come in others colors? Our T-squares used to be green, but we had so many requests for black that we changed to a black matt finish. We couldn’t be happier, it looks fantastic. But, if you want another color for your t-square it would be very easy for you to spray paint your new t-square. If you use a quality product like Krylon Professional All Surface Enamel paint, it should look great and last for years. How can I tell if my guide rail will work with your T-square? You’ll need 4 crucial measurements to determine if your guide rail will work with the VerySuperCool Tools T-square. Your guide rail tubing should measure 3″X 2″ (3 inches horizontal and 2 inches vertical). You need to have a 13/16 inch step down (21mm) from the top of the table to the top of the installed tubing. You need to have a minimum of a 3/4 inch gap (21 mm) for parallel spacing throughout the entire length of the angle iron and tubing connection. Your guide rail tubing can measure 50-80mm (2 – 3.15 inches) horizontal and 50mm (2 inches) vertical. You need to have a 21mm step down (13/16 inch ) from the top of the table to the top of the installed tubing. You need to have a minimum of a 20mm gap (3/4 inch) for parallel spacing throughout the entire length of the angle iron and tubing connection. If you have a Beisemeyer fence, with 3”x2” guide rails on your saw, our standard T-square will work perfectly! NOTE: Not all Beisemeyer fences are 3″x2″. In the early years of development there were some variations of the Beisemeyer that were outside of the standard 3”x2” guide rails. Since the 1980’s the Beisemeyer style has become the standard style of fence for table saws, band saws, router tables. But there are many different sizes of angle iron and tubing that can be connected together, so not all will work with our system. So even if you have a Beisemeyer “style” table saw fence we recommend you take some measurements to make sure our T-square will work. After checking these measurements if you still aren’t sure, give us a call at 512-537-5255. We’ll be happy to help you figure it out. I have round rails, will your T-square work with it? No, our T-square does not work round guide rails. If you have round rails you will need to replace them in order to use the VerySuperCool Tools T-square. You can either buy new guide rails or make your own. It was common for some of the old table saws to have round rails. Older table saws are many times in fantastic condition. They were built extremely solid back then. If you have an older table saw round rails or find a good deal on an older table saw round rails you can easily update it by adding a proper guide rail. Even today some Euro style table saws are still made round rails. It’s not hard to modify though if you want to turbo-charge your existing saw and add a VerySuperCool Tools T-square. Making guide rails is easier than you think. AskWoodMan has a step-by-step video series showing how to do it yourself. Google “How To Make Your Own Guide Rails” or visit DIY GUIDE RAILS located in the How To Video section of our website. Why don’t you sell guide rails? Guide rails are very heavy and awkward in size. As a small company we can not ship competitively, it just costs too much. We recommend making your own or purchasing guide rails through larger companies like Grizzly or Delta. Don’t forget to search on Amazon.com. You never know what kind of deal you’ll find. Where can I buy guide rails? We recommend you shop online at Grizzly.com and/or Amazon.com to see what’s currently available. What about making my own guide rails? Making your own table saw guide rails is easier than you think. AskWoodMan has a step-by-step video series showing how to do it yourself. Google “How To Make Your Own Guide Rails” or visit DIY GUIDE RAILS page on our website. I am not a welder, can I still make my own guide rails? Good news! No welding is necessary to make your own guide rails! A drill press is highly recommended but not required. Watch Allan’s complete DIY GUIDE RAIL video series for full details. What materials and tools do I need to make my own guide rails? A guide rail is made up of two basic components: A piece of angle iron and a piece of rectangular tubing. Making your own guide rails is composed of making two attachments: Attaching the tubing to the angle iron and then attaching the angle iron to your saw and extension table. Angle iron, 3″x3″x1/4” – Length determined by your table saw. Rectangular tubing, 3” x 2” 11 gauge – Length determined by your table saw. Usually 6 – 12 inches longer than angle iron. 1/4″-20, grade 8, cap head screws, 3/4″ long with washers and lock washers for attaching the tubing to the angle iron. How many you need will depend on your spacing. 5/16″ counter sunk, grade 8, 1.1/4″ long flat head, allen key bolts with washers, lock washers and nuts for attaching the angle iron to the saw. How many you need will depend your table saw. High quality primer and paint –Have your guide rails professionally powder coated or buy some high quality primer and paint. Adhesive backed measuring tape – We recommend (and sell) a Starrett SAE/Metric left to right, 6 foot self-adhesive tape. Drill press – Highly recommended, but not essential. Drill bits – A #7 and a 5/16″ – If you don’t have a #7, you can use also use a 13/64″ drill bit. Countersink (U.S.) – I like to use a 3/4″ diameter single flute HSS 82 degree countersink with 1/2″ shank. Hand tap – For tapping you can use a spring loaded tapping center, tap wrench, manual hand tapper or even a pair of vise grips. Clamps – We think Bessey Rapid action clamps are the best! TIP: AskWoodMan likes to use a Jigsaw with bimetal jigsaw blades for cutting the miter gauge notches out. 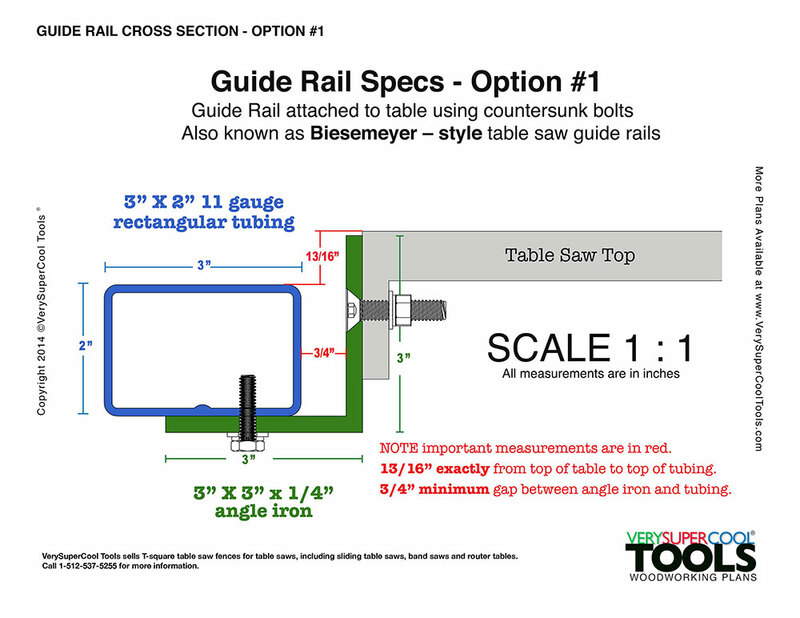 Read Allan’s DIY Guide Rail Checklist blog post for even more detailed instructions. How many holes do I need to drill and where? How many holes you need all depends on the length of your guide rail and how your table is made. Drilling into the bottom of the angle iron that attaches to the tubing. To attach the tubing to the angle iron I used 1/4″-20, grade 8, cap head screws, 3/4″ long. NOTE: A hex bolt would work just as well but your spacing will have to be adjusted accordingly. Generally it’s good to be 1-2 inches in at both ends of the angle iron. And then equal spacing between those holes if possible with the spacing not to exceed 12 inches apart. If the spacing doesn’t add up nicely, add an extra bolt if you have to. To attach the angle iron to the saw I used 5/16″ counter sunk, grade 8 bolts, 1.1/4″ long with washers, lock washers and nuts. NOTE: Hex bolts would work just as well. Make countersink holes in your angle iron to attach to your table saw and extension table. If you don’t have a countersink you can hex bolts just as easily. Spacing is not a concern when attaching the angle iron to the table. The more important concern is finding solid connection points. Some tables may be so narrow that you can only have two bolts connecting and others may have up to four. There many different types of table saws. How your cast iron table was made (cast iron webbing configuration ) will determine how much access you have to drill and bolt. What about guide rail placement? How do you figure that out? Placement is super easy. There are 2 crucial measurements you need in order to have your guide rails positioned correctly. You should have a minimum of a 3/4″ or 20 millimeters gap evenly spaced down the entire length of the of your guide rail. Your step down should be 13/16″ or 21 millimeters . This is an exact dimension, as set by Biesmeyer, for installing Biesemeyer style guide rails. Visit our Table Saw Guide Rail Installation blog post for more details and photos. Do you have any guide rail drawings available? Yes we do (click to enlarge drawing below). Currently we are compiling all of the guide rail information we have into one pdf document. Our “How To Make Your Own Guide Rails” pdf will be a free download containing all the specs, materials, tools, directions, drawings, photos as well as links to instructional videos. Much of the information will be found throughout out website, but the downloadable pdf will consolidate everything and make it more convenient for people print, study and get started upgrading their table saws and band saws with a new improved guide rail. Should I get the 42″ or the 48″ aluminum extrusion? Either length will work just fine, in fact some woodworkers like to have both so they can have multiple setups at hand. But most people will be perfectly happy with just owning the 42″ extrusion. FACT: For 90% of table saws the 42” aluminum extrusion is more than enough. The 48” is available because there are people that are retrofitting older industrial table saws (like Olivers and Northfields) and they need to span their entire cast iron table top. In addition, 42′ extrusion is lighter and easier to manage than the 48″. Many times you don’t need the extra inches, so why maneuver a heavier fence than you need to? We designed our tall auxiliary fence so that it fits either the 42″ or 48″, with all bolts engaged. So if you have the 42″ aluminum extrusion, attaching our auxiliary fence will give you added length making your fence slightly over 47″ long. This way you have the best of both worlds and more options for your woodworking proejcts. Can I buy just an aluminum extrusion from your store? Yes you can! As of December 2014 we started selling our own proprietary precision machined aluminum extrusions. We offer 42″ and 48″ lengths. If you don’t need a precision extrusion, you can shop on your own or visit our Aluminum Extrusion Resource Guide to help you find the best deal. Where else can I find/buy aluminum extrusions? We thought you might ask that. Please visit our Aluminum Extrusion Resource Guide for all the specs and links you’ll need. What if I don’t have an aluminum extrusion? If you are out of the U.S. and you just can’t get access to an aluminum extrusion or don’t want to spend the money on shipping, you can still use our VerySuperCool Tools T-square and be very happy. You can easily attach a milled up straight piece of wood, some steel tubing or a piece of angle iron as your fence. If you can figure out how to bolt it to our mounting block, you can use it as a fence. Will your T-square system work for a bandsaw fence? Yes, as long as your band saw guide rail follow our dimension guidelines, the VerySuperCool T-square fence system will work perfectly. Are band saw guide rails different that table saw guide rails? No. Table saw guide rails and fences and bandsaw guide rails and fences are essentially the same. Band saw guide rails are shorter, that’s all. Our VerySuperCool T-square fence system will work on table saws and band saws alike. Watch AskWoodMan’s DIY band saw guide rail video series on YouTube. See AskWoodMan’s DIY band saw guide rail project photos on Flickr. Do I need a shorter pieces of aluminum extrusion for a band saw fence? No you don’t. While the band saw guide rails are shorter, the fence itself doesn’t have to be shorter. You can manage just fine with the 42” extrusion. You’ll have some overhang, but it shouldn’t interfere with your work. If you prefer to have a shorter piece of aluminum you can look online and find short pieces pretty easily. Visit our Aluminum Extrusion Resource Guide for the specs you’ll need. How long after payment will my order ship? We ship most items the next day. If we can’t ship the item the next day we’ll let you know right away. If you order after midnight you may still have to wait until the next day for shipping. NOTE: When we ship multiple items they frequently come in two separate shipments and don’t always arrive on the same day. Depending on where you are in the country, and the weather conditions, most orders are received within 3 – 5 working days. We like the reliability of UPS and U.S. Priority Mail. NOTE: Shipments out of the U.S. (including Alaska, Hawaii and Puerto Rico) take longer. Do you ship orders with UPS or U.S. Mail? The majority of our shipments are done through UPS. We also ship U.S. Priority Mail as needed. We never ship Federal Express unless it’s the only option or it is requested by the customer. FedEx shipping usually results in added cost to the customer. When shipping multiple packages from different locations it’s hard to guarantee that they will all arrive on the same day. If you are concerned about where your items are you can check your email for a tracking number from UPS or give us a call. But most times your second box will arrived the next day. Why can’t everything ship in one box to save money? Whenever possible we consolidate your order for efficiency. But the fact is that these items are all very different sizes and shapes and it’s not possible to put them all in the same box. In addition, not all products ship from the same location. But most importantly, we carefully package our products to ensure their safe arrival. It’s no savings to anyone if the product is damaged. How much to ship to the Continental U.S. (48 states)? Shipping any style T-square $20.00. Shipping Bessey clamps varies by order and is drop shipped from Bessey Tools. You will see shipping costs at checkout. Shipping for custom Bessey Tools orders will be quoted individually. We’ve shipped to over forty countries to date. Shipping overseas can be costly, but we do our best to work with you. Just fill out our shipping quote form with the items you are interested in, and we’ll let you know your options. We offer a variety of payment options and accept all major credit cards including American Express and Discovercard. Shop our store using your credit card or your Paypal account if you have one. Pay by phone by calling 512-537-5255 9 am – 9 pm Central Standard Time, 7 days a week. Email or call us and tell us what you want and we’ll send you an invoice you can pay without going through our store. Email us what you want and we’ll send you an invoice with the total. No. You absolutely do not need a PayPal account to purchase through our store. We think PayPal is the faster, safer way to send money and we trust them as our merchant services provider. You do not need to pay with a PayPal account, you can use any credit card and pay using our PayPal service. When you check out from our store, you will be taken to a window where you can click “Pay with Paypal account” or “Pay without PayPal account” – screenshot below. And remember, if you don’t want to mess with anything online, just give us a call. We’ll take your information by phone, quick and easy. Do I have to pay sales tax since it’s an online purchase? Yes, but only if you reside in Texas. NOTE: Texas law requires us to charge sales tax on both the items and the shipping. Pay with your PayPal account. Pay by mailing a personal or business check. For fastest service, fill out a shipping quote and we’ll email you the amount. After approved we will email you a digital invoice for payment. PLEASE NOTE: For countries that have high credit card fraud, (for example Nigeria, Malaysia, Ghana, Egypt, Romania – link to full list below) we frequently request a personal or company check to clear before shipping. We may also require Skype or Facetime communication for added clarity and to ensure that you are ordering the correct item. We do not accept money orders or wire transfers from overseas. Fake money orders and wire transfer scams are at an all time high. There are many countries that are on a watch list because of fraudulent activity. If you reside in one of these countries we apologize for the inconvenience. We will still do our best to sell to you but will be taking added precautions. Billions are lost each year because of credit card fraud and it’s growing every year.